Since my photo sessions are usually candid lifestyle portraits, most families don't need to bring much with them. 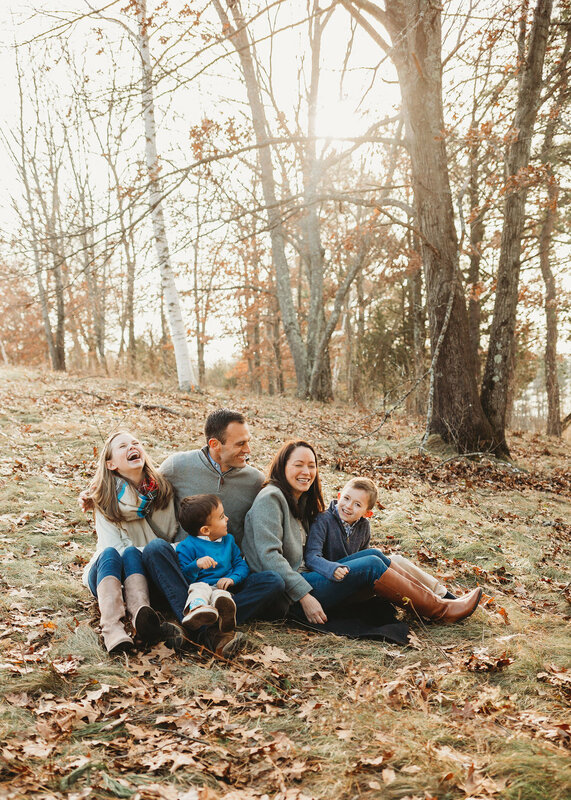 And while I encourage you to show up 100% yourself, there are a few things that might make your family session a little more comfortable, or in some cases, more fun. Since we usually take family portraits outdoors to take advantage of New England's gorgeous scenery, that means we're going to encounter nature in all its beautiful--and sometimes buggy--glory. I want your memories of your photo session to be focused on family connection and love, not on the number of bites you got during our time together! While I carry a simple white blanket with tassels to every session, if you have a blanket that goes with your outfits or one that has particular meaning to you, please feel free to bring it along to your photo shoot. Reds, oranges, and other bright colors can reflect on your skin in funny ways, so I suggest sticking with something neutral in tone, like a beige, cream, or grey. If you have a long haired kiddo, you'll probably be much happier with your photos if their hair isn't in their face! A simple bobby pin or clip will usually do, but I suggest bringing a few. Kiddos do a lot of movement during my sessions and pins have a habit of falling out with all the running, playing and dancing. Speaking of movement, we'll probably do quite a bit of it during your photo shoot so it's a good idea to bring along a bottle of water--and snacks! I always suggest having a snack (and having a bathroom break) before arriving at our shoot location, but hey, you can't argue with a rumbling tummy. Wipes are helpful for everyone--not just little kids! From cleaning up crusty noses to fixing makeup to wiping hands before or after an impromptu snack, wipes are incredibly handy to have on hand. If you have a pack on hand, just throw it into your bag. If you aren't accustomed to carrying them anymore, I suggest buying the individually wrapped ones. They last for a long time and you can take them with you when you travel.